Musicians make their mark on the world through the melodies and lyrics that they write, but the experiences that have led them to make music are often just as intriguing as the songs themselves. There are so many world-famous musicians whose stories have made it to the big screen to shine a light on their little-known struggles, but spotlighting those who never achieved the same level of prominence can be just as effective, especially because it invites an audience to get to know a real-life person primarily through their portrayal on screen without any predispositions about them. Blaze Foley (Benjamin Dickey), born Michael Fuller, was an Arkansas native who spent most of his childhood in Texas. His musical performances were pretty legendary, influenced in large part by three different segments featured in the film: his meeting and ultimate romance with Sybil Rosen (Alia Shawkat), one of his more unforgettable nights on stage with a bottle close to his hand, and being remembered by the two people closest to him in a posthumous radio interview. Those three eras of Blaze dissect what it was that made this man into such a presence whose popularity has only grown since his untimely demise at age thirty-nine. If nothing else, this film does a mesmerizing job of portraying Blaze, brought to life by Dickey, who is a musician in his own right. He’s remarkably honest, relatable, and vulnerable as the sweet-talking boyfriend in love with Sybil, unconcerned about where he might go until the allure of life on the road gets to him. When he’s on stage later with considerably more facial hair and far less of a grip on his own faculties thanks to a heavy intake of alcohol, he’s less recognizable but still just as into his music. And when he’s but a memory for his friends to recall, he still looms large and dominates the film. 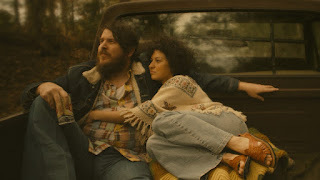 Dickey, who received resounding applause when he took the stage following the film’s largest screening at Sundance, won a well-deserved special jury award at Sundance for achievement in acting, fully sinking into and becoming this character. Opposite him, Shawkat, best known for awkward comedy, is a surprisingly good foil, encouraging him but ultimately doomed to fall behind when music shows up to take him other places. The ensemble contributes well to a story that’s definitely interesting but also, perhaps purposefully, relatively slow-paced, clocking in at two hours and seven minutes. Director Ethan Hawke, who himself is more often in front of the camera, is obviously passionate about his subject, which makes a decent case for itself but isn’t always as riveting as it should be.